On the back stairs of the extremely haunted Old Washoe Club. These stairs were used to usher prostitutes into the upper levels of this building, known as The Millionaire's Club. We visited the Old Washoe looking for ghosts in the VERY spooky back cellar, where corpses were stored during the winter, waiting for the ground to thaw so they could be buried. I have been incredibly lucky to grow up and currently live in a place so stuffed full of Raw American History that it's practically exploding with costuming opportunities every weekend. 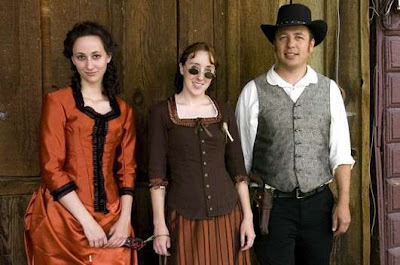 When I was a kid, my school group would take field trips to Virginia City, a silver mining boomtown that burst to live in 1859 with a silver strike as big, as important, and as seductive as the California Gold Rush 10 years before. This was known as The Comstock Lode, and drew miners, and all that comes with them, for the next 40 years, when the Lode was mined out, and Virginia City fell into obscurity and disrepair. All this a mere 25 or so miles from my home. Today Virginia City, a small, tumbled town tucked onto the side of a mountain, is a tourist spot choc full of events, reenactors, historical attractions, haunted tours, mines you can explore, and fully restored steam trains. It is as wild, dirty, and untamed as I imagine it to be 150 years ago. Gentlemen cowboys walk down the street weighed down with jingling spurs and at least two, if not more, Colts slung across their hips - some of them are in costume, and some of them are just coming to town for a drink after a days work. The old buildings curve, twist, and tilt with the road, built atop silver mines shooting deep into the mountain the City clings to. It's the perfect place to lose yourself in history...if you close your eyes, you can almost believe it. Oscar Sessions, myself, and Maggie Waterman, on the (again) haunted spiral staircase that used to be the Gentlemen's entrance to the Millionaire's Club. This staircase is the longest unsupported (by a center pole) spiral staircase in the West. It was CREEPY. A group of friends from both Reno and San Francisco, plus myself, decided to spend the day in costume, walking up and down the boardwalks, stopping for photos with tourists and kids, and shopping. 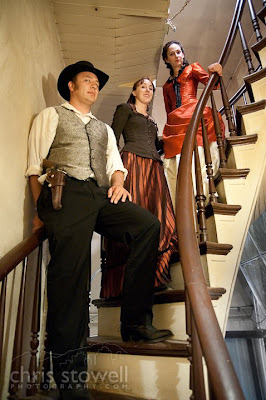 We explored the extremely haunted Old Washoe Club, and snapped a few pictures, before changing into evening attire and attending the Masquerade Ball at the recently restored Piper's Opera House, another spooky, amazingly historical, and haunted playhouse. I hope you enjoy these first couple of photos from the day. I will post more later as I find them! 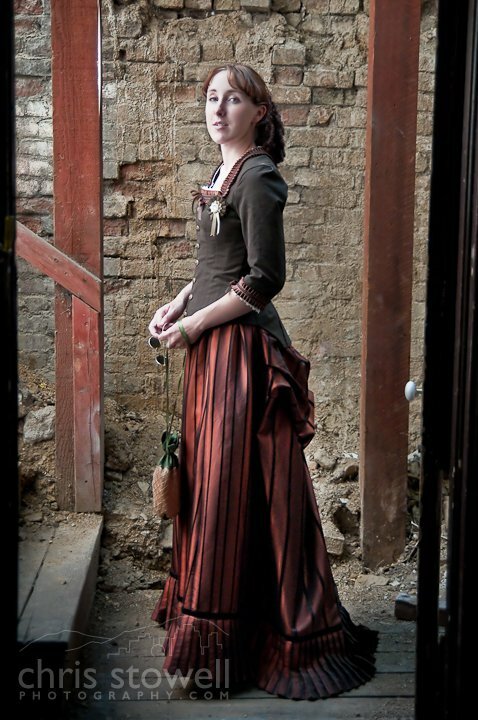 I wore an 1885 gored skirt, from Truly Victorian (TV261), but I did not wear a bustle, which caused the skirt to droop in a way similar to earlier styles of the 1870s. I did this because I made my day bodice using the Truly Victorian 1879 Cuirass bodice (TV420), and the tail of the bodice in back did not flare to accomodate a bustle. I altered the Cuirass bodice pattern, cutting the neck into the square shape typical of the 1870s, but leaving the back high. 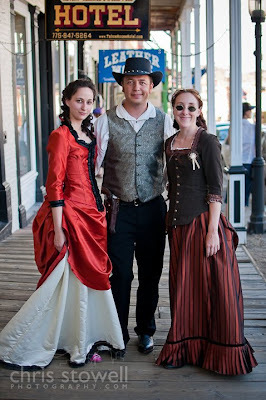 It is made with bottom-weight dark brown striped cotton, flatlined with white muslin, and worn over a corset. I am very happy with how it came out, and how well it complimented the skirt! You really are one stylish lady! That skirt drapes beautifully and though I don't normally like browns, the colours are lovely - what's happening to me, you're converting me to earthy colours?! What a wonderful place! And such gorgeous pictures. Thanks Ladies! Contrary to, erm, every costume I've lately sewn, I DO like bright colours, like beautiful pinks and salmons, and lovely greens and stuff, but for some reason I keep making very subtle things, which is not to say I don't like subtletly of colour too. Oh, lol, I just like all the colours!!! except purple. Wonderful! You look amazing! I love you gown. This is a great idea and you look darling. I saw a bit on this place on Ghost Hunters on ScyFy and it was creepy. 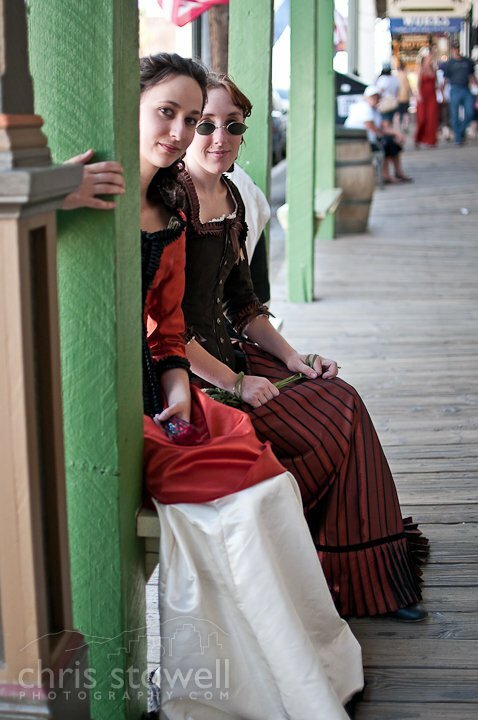 I'm a makeup artist in Utah who is in love with all this historical and fabulous, so I stumbled onto your blog. What an informative, fun thing you have here! I've enjoyed reading and your talent astounds me.